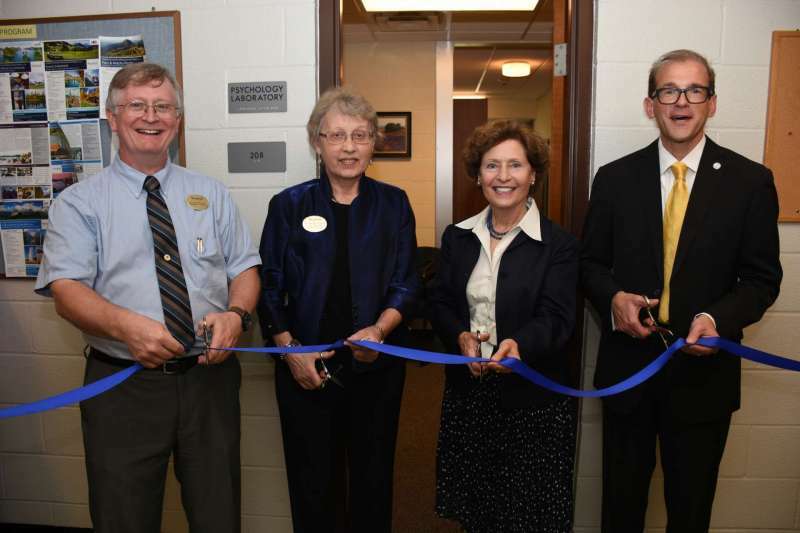 Pictured cutting the ribbon for Shepherd’s new psychology lab are (l. to r.) Dr. Larry Daily, chair, Department of Psychology; Dr. Ann Marie Legreid, dean, College of Social and Behavioral Sciences; President Mary J.C. Hendrix; and Acting Provost Scott Beard. 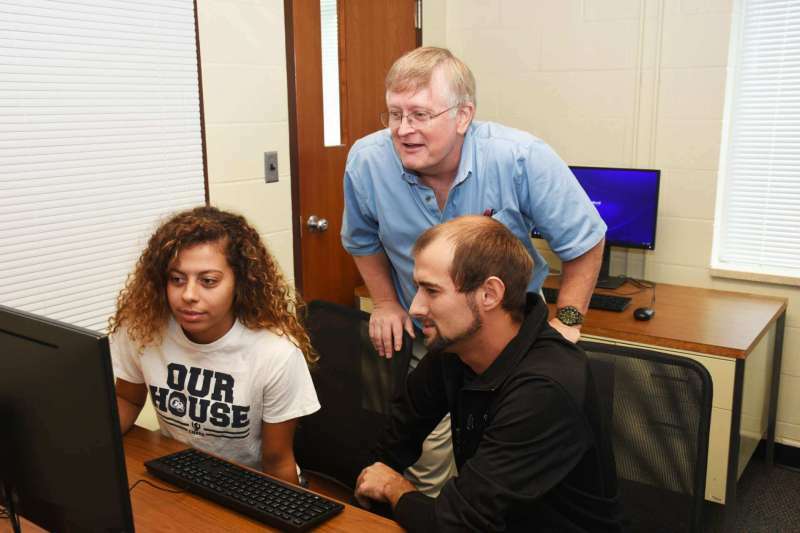 A new laboratory at Shepherd University will allow students and professors in the Department of Psychology to conduct more research. The department, which is part of Shepherd’s newly formed College of Social and Behavioral Sciences, received a $30,000 grant from the West Virginia Higher Education Policy Commission Health Sciences Division for the lab, which is located on the second floor of White Hall. “Having a place dedicated to psychology research allows both the faculty and students to do more and better professional research,” said Dr. Larry Daily, chair of the psychology department. Until now, faculty and students have had to seek out classroom space to conduct research, hoping they wouldn’t be interrupted. Daily said psychology research often requires working with participants in a distraction-free environment, and the information collected must be kept confidential. The new lab provides a quiet and private area to conduct research. Because the computers in the lab are dedicated to the psychology department only, they have the needed software to better control the research and keep the data private. Two faculty offices, a closet, and part of a classroom have been converted to lab space. There’s a reception area that will be primarily used to receive research participants and provide a place where they can fill out paperwork. The room can also be used for individual and small group meetings. A hallway from the reception area leads to a general workroom with a couple of computers where students can enter data and write research reports. Daily said the computers in the lab have a special software package that will make conducting research much easier and will give students and faculty more research options. A multipurpose conference room that has a table and computer stations will provide enough space to conduct research that requires subjects to move around. A small room with a one-way mirror will allow researchers to observe what’s going on in the conference room. The lab also has a storage cabinet to house special equipment. “We were trying to design this space to be as flexible as we could to meet the needs of as many faculty and students who are doing research as possible,” Daily said. Daily sees a lot of uses for the lab. Faculty members have conducted research on everything from how meditation affects stress reduction to whether participating in leisure activities impacts well-being. Potential future research projects that can be implemented in the lab include color vision and healthy eating; stress, meditation, and neurofeedback; multisensory perception and aging; changing attitudes toward health behaviors; increasing compliance with medical advice and behavioral follow-through on health decisions; leisure activities and wellness; and personality and leisure activities. Daily envisions collaborating with other departments on projects as well. The College of Social and Behavioral Sciences includes five departments: family and consumer sciences, political science and global studies, psychology, sociology and geography, and social work. The college gives students the chance to participate in community outreach through its various programs, which often collaborate with nonprofits and government organizations to offer training and volunteer opportunities. Shepherd’s award-winning Model United Nations and Debate Team are also part of the College of Social and Behavioral Sciences. Students work in the new psychology lab with Dr. Larry Daily.